For purposes of the statistics and charts in this report, our database includes venture financing transactions in which Wilson Sonsini Goodrich & Rosati represented either the company or one or more of the investors. We do not include venture debt or venture leasing transactions. In the third quarter of 2011, positive trends in venture capital financing terms largely continued, with a relatively large number of later-round financings having higher valuations than the prior round, and ongoing relatively high valuations at all stages of development. These trends likely indicate that funds have been able to exit investments in struggling portfolio companies or have otherwise been able to rationalize investments in higher growth opportunities, and also reflect continuing overall improvement in many technology sectors. Since many of the financings that closed in the third quarter were based on terms agreed to late in the second quarter and early in the third quarter, prior to the ongoing volatility in the public markets that began in mid-August, it is possible that these trends will not continue in the fourth quarter. Up rounds continued to comprise the substantial majority of equity financings in Q3 2011, at 78% of all deals. This figure represents a notable increase over Q2 2011 (71%) and Q1 2011 (72%), and the continuation of a trend since Q1 2010, where up rounds comprised only 45% of all deals, an increase of more than 30 percentage points. 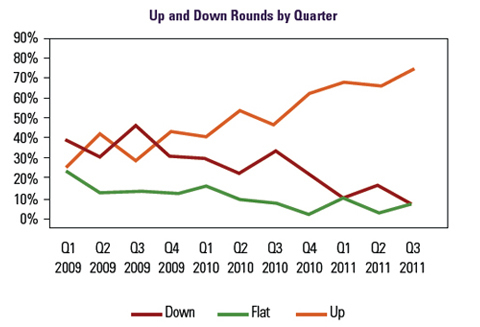 Conversely, down rounds as a percentage of all deals decreased from the prior quarter, from 21% in Q2 2011 to 11% in Q3. This also reflects the continuation of a trend that has seen the percentage of down rounds decrease from 35% in Q1 2010. Flat rounds increased from 8% in Q2 2011 to 11% in Q3. The average valuation for first-round venture investments in Q3 2011 was slightly lower than in Q2 2011, but higher than any other of the last seven quarters. The median pre-money valuation for closings in Q3 2011 Series A rounds (other than angel deals) was $5.6 million, down from $6.1 million in Q2 2011 but higher than $5.4 million in Q1 2011 and $5.3 million in Q4 2010. Q3 valuations for more established companies showed mixed results versus those in prior quarters. 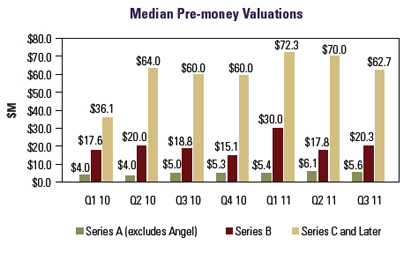 Median pre-money valuations for Series B transactions increased from $17.8 million in Q2 2011 to $20.3 million in Q3, although both figures were down substantially from the $30.0 million median Series B pre-money valuation in Q1 2011. 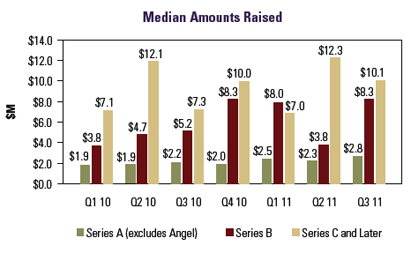 For companies raising funds in Series C and later rounds, median pre-money valuations declined modestly, to $62.7 million in Q3 2011 from $70.0 million in Q2 and $72.3 million in Q1. Overall, valuations at all levels in Q3 were higher than those in Q1 2010, and reflect a more positive investment environment, largely driven by a robust mergers and acquisitions market and an improvement (until recently) in the public markets. Liquidation preferences. The most notable trend in Q3 2011 was the relative increase in the use of pari passu liquidation preferences as compared with senior preferences. In Q1 and Q2, these terms were used roughly equally, but in Q3 2011, pari passu liquidation preferences appeared in 150% more deals than senior liquidation preferences. Specifically, in Q3 2011, Series B and later rounds had senior liquidation preferences in 38% of deals, down from 51% in Q2 2011. The prevalence of such preferences decreased in both up rounds (from 41% in Q2 to 29% in Q3) and down rounds (from 78% to 50%). Conversely, the use of pari passu liquidation preferences increased overall from 47% in Q2 to 60% in Q3, particularly in up rounds (from 59% to 67%). Interestingly, there was a substantial increase in the use of pari passu liquidation preferences in down rounds (from 11% in Q2 to 50% in Q3), although this may have been affected by the small sample size. Anti-dilution provisions. Broad-based weighted-average anti-dilution was overwhelmingly prevalent, and its proportional use stayed relatively constant, at 93% of all deals in Q3 2011 as compared with 92% in Q2 2011. The use of narrow-based weighted-average declined from 3% to 2%, and ratchet anti-dilution went from 2% to 0%. Pay-to-play provisions. The use of pay-to-play provisions increased from 1H 2011 to Q3 2011, from 9% of deals to 12%. While usage actually decreased in down rounds, from 30% of deals in Q2 to 0% in Q3, this decline was outweighed by the increase in up rounds, where pay-to-play usage rose from 6% of deals in Q2 to 14% in Q3. The relatively small changes may be a statistical anomaly, again due to a relatively small sample size. Redemption. The use of redemption provisions increased from 22% of deals in 1H 2011 to 30% in Q3 2011. Investor-option redemption (used in 26% of deals in Q3) continued to be far more popular than mandatory redemption (4%). 1It is important to note that the median amounts raised are calculated on a quarter-by-quarter basis only, and do not reflect the total amounts raised by a company if funding for a given round occurred in multiple quarters. For example, 23% of the companies that raised funds in Q3 2011 also raised money in prior quarters, and a significant percentage of them expect to raise additional funds later in 2011 in the same round of financing. 2Numbers do not always add up to 100% due to rounding. 3Includes flat rounds and, unless otherwise indicated, Series A rounds. 4These columns include only Series B and later rounds. Note that because the numbers in the All Rounds columns include Series A and flat rounds, they are in some cases outside the ranges bounded by the Up Rounds and Down Rounds columns. For more information on the current venture capital climate, please contact any member of Wilson Sonsini Goodrich & Rosati's entrepreneurial services team. To learn more about WSGR's full suite of services for entrepreneurs and early-stage companies, please visit the "Entrepreneurial Services" section of wsgr.com. For more information about this report or if you wish to be included on the email subscription list, please contact Eric Little. There is no subscription fee. This communication is provided for your information only and is not intended to constitute professional advice as to any particular situation. Please note that the opinions expressed in this newsletter are the authors' and do not necessarily reflect the views of the firm or other Wilson Sonsini Goodrich & Rosati attorneys.